Title Fight has premiered a music video for “Rose of Sharon” which is off their upcoming album Hyperview. The album will be out on February 3rd via Anti-, and finds the band mellowing out significantly to explore a shoegaze influenced sound that ups the reverb and swirling melodies that pull the listener in. It’s a different direction for Title Fight that some fans might not be into, but I like that the group is exploring so many different styles from one album to the next. They will head out on a headlining tour beginning in March, check out the full list of dates below. Title Fight released a new video today for the song “Rose of Sharon”. Watch the video at Pitchfork now: http://pitchfork.com/news/58023-title-fight-share-rose-of-sharon-video/. 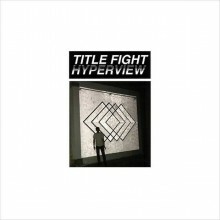 “Rose of Sharon” is featured on Title Fight’s new album Hyperview out February 3 on Anti-. Hyperview is the third album release from Kingston, PA-based band and their inaugural with Anti-. On the album, dreamy guitars weigh heavy and carry the meaning of the songs while hazy vocals make the album feel like the soundtrack to a gorgeous dream. Longtime fans of Title Fight will appreciate the band’s previous releases as a natural development into their newer sound. But first time listeners can just as easily get wonderfully lost in the music all the same. Title Fight has announced plans to embark on a headlining tour. Merchandise and Power Trip will join as support for the first leg of the tour, March 6 – March 16. On the second leg, March 21 – April 5, Title Fight and La Dispute will co-headline with The Hotelier as support. Tickets are on sale now.